Carp edema virus disease (CEVD) is an emerging disease of concern to koi enthusiasts and carp Aquaculture in the United States and around the world. Carp edema virus can cause disease and high mortality rates in wild and cultured varieties of common carp (Cyprinus carpio) including koi. Sick fish may exhibit erosive or hemorrhagic skin lesions with swelling (edema) of the underlying tissues, thus the disease was originally named “viral edema of carp” (Oyamatsu et al. 1997a). The disease has also been referred to as “koi sleepy disease” (KSD) because infected fish become lethargic and unresponsive (Miyazaki et al. 2005). The severity of disease is greatest in juveniles, which may hang just under the surface of the water before succumbing, while adult fish may lie motionless on the bottom of the pond/tank. Carp edema virus disease/koi sleepy disease was first characterized from Japanese koi in 1974 and since has been shown to be widespread across Japan where koi are cultured (Murakami et al. 1976; Ono et al. 1986; Amita et al. 2002). The international trade in koi has likely led to the global spread of CEVD/KSD with outbreaks documented in imported koi in North America and Europe (Hedrick et al. 1997; Way and Stone 2013; Haenen et al. 2013). In the United States, CEVD/KSD has been associated with outbreaks in imported and domestic koi in the following states: California (in the years 1996 and 2010), Washington (2005), North Carolina (2005), Georgia (2005 and 2010), and Florida (2014 and 2015) (Hedrick et al.1997; Waltzek et al. 2014). Carp edema virus has been detected widely across Europe in koi from at least Austria, Czech Republic, France, Germany, the Netherlands, and the United Kingdom (Haenen et al. 2013; Way and Stone 2013; Jung-Shoroers et al. 2015; Lewisch et al. 2015; Vesely et al. 2015). The virus has recently been detected for the first time in the southern hemisphere on koi farms in Brazil (Viadanna et al. 2015). Carp edema virus has been detected in common carp within Austria, the Czech Republic, Italy, Poland, the Netherlands, and the United Kingdom (Way and Stone 2013; Lewisch et al. 2015; Pretto et al. 2015; Vesely et al. 2015; M. Reichert personal communication; O. Haenen personal observation). Carp edema virus is a large, double-stranded DNA virus thought to belong to the poxvirus family of viruses (family Poxviridae). Carp edema virus disease/koi sleepy disease should not be confused with another disease referred to as “carp pox,” which is caused by a herpesvirus (Cyprinid herpesvirus 1) that causes wart-like growths on the skin in common carp varieties (Hartman et al. 2013). Although CEV has not been grown in the laboratory by cell culture, poxvirus-like particles have been visualized in infected gill epithelial cells by transmission electron microscopy (Ono et al.1986; Hedrick et al. 1997; Oyamatsu et al. 1997a; Miyazaki et al. 2005). What are the signs of CEVD/KSD? As the common name “koi sleepy disease” implies, CEVD/KSD-infected larger carp and koi display behavioral abnormalities including unresponsiveness and lethargy, with fish often lying motionless on their sides or bellies on the bottom of the tank for long periods of time unless disturbed (Figure 1). If the “sleepy” carp or koi are disturbed, they may swim for a short period of time, but soon settle back into an inactive state on the bottom of the tank (Miyazaki et al. 2005). In CEVD/KSD, weakened juveniles may swim slowly and aimlessly along the margins of the pond/tank or hang motionless just under the surface of the water (Oyamatsu et al. 1997a). However, it should be noted that one of the authors (A. Goodwin personal observation) has observed a similar “sleepy” presentation in fish due to sudden (acute) swim bladder under-inflation after stressful harvest or handling. Infected fish will often refuse to eat, which further weakens the fish. Diseased juvenile koi may have extensive erosions or hemorrhages of the skin with edema (swelling) of the underlying tissues (Miyazaki et al. 2005). How is a CEVD/KSD diagnosis reached? In addition to an appropriate case history and clinical signs, further supporting evidence of CEVD/KSD may be obtained by examining wet mounts of the gills. In the early stages of the disease, the gill epithelial cells at the tips of the gill filament proliferate, resulting in a thickening or “clubbing” appearance (Ono et al. 1986; Miyazaki et al. 2005). In CEV-infected fish, the proliferation may extend to the base of the gill filament and impair gill function. Thickening of the gill tissue is not a problem exclusive to CEVD/KSD, and in many cases may be caused by other issues such as poor water quality. Also, as with many fish diseases, there may be secondary or opportunistic infections that occur in CEV-infected carp and koi (Haenen et al. 2013; Lewisch et al. 2014). Observation of microscopic abnormalities from stained slides prepared from formalin-fixed gill and skin tissues (histopathology) can further support a CEVD/KSD diagnosis. Typical lesions observed by light microscopy include: 1) hypertrophy (increased size) and hyperplasia (increased numbers of cells) of the gill epithelium with associated inflammation and 2) extensive destruction of the skin and edema (swelling) of the underlying tissues (Oyamatsu et al. 1997a; Miyazaki et al. 2005). A definitive diagnosis requires specialized laboratory testing such as Polymerase Chain Reaction (PCR) that detects the DNA of CEV (Oyamatsu et al. 1997b). Recently validated PCR tests have been developed and are available at the University of Florida’s Wildlife and Aquatic Animal Veterinary Disease Laboratory in Gainesville (Waltzek and Viadanna unpublished). 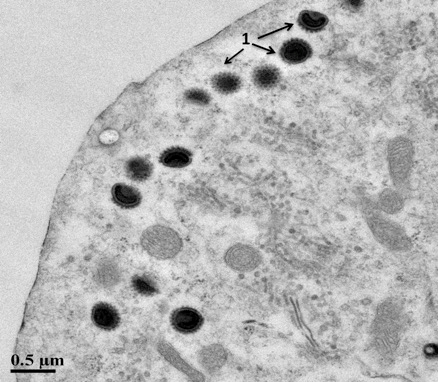 Transmission electron microscopy of gill tissues may also be used to demonstrate hypertrophied (enlarged) gill epithelial cells containing large spheroid poxvirus-like particles (Figure 3). To date, the virus has not been propagated in cell culture (Oyamatsu et al. 1997a). How do fish get infected with CEV? In Japan, CEVD/KSD typically occurs in the rainy season among juvenile koi (young-of-the-year) after they have endured the stress of being moved from green-water earthen nursery ponds into clear-water concrete-lined ponds for grading. Although the source of the virus is unknown, presumably juvenile koi are exposed before or during the stress of capture and subsequently show signs of the disease. As mentioned above, fish may also lie on the bottom of the tank in situations where CEV is absent. This phenomenon typically occurs after harvest from ponds when water temperatures exceed 27°C (80°F), and affects nearly 100% of fish within 1 hour of handling. 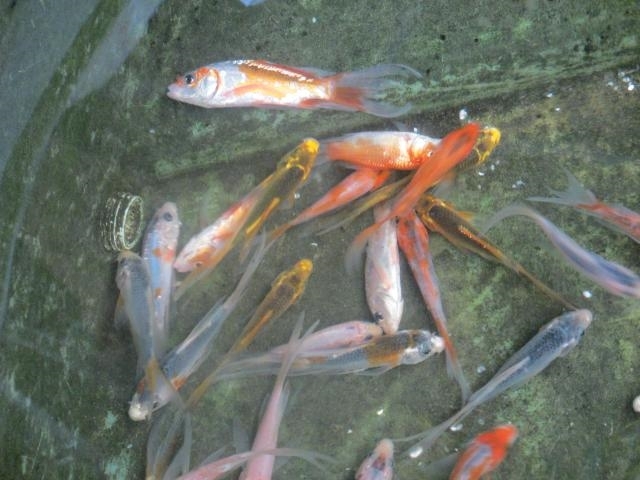 Typical CEVD/KSD outbreaks occur after the addition of infected fish without quarantine into an established pond of koi that are presumed to be naïve, which means never exposed to CEV. Mortality in naïve koi or common carp exposed by bath challenge to CEV begins as early as day 6 and continues until day 16 post-infection (Oyamatsu et al. 1997a). The aforementioned study suggests the virus may be transmitted via exposure to contaminated water. Thus, diseased fish shedding virus into the water from gill and skin lesions are likely an important mode of transmission. Whether CEV is vertically transmissible (i.e., from breeders in the eggs or sperm) and whether CEV-exposed fish clear the virus after infection or can harbor the virus as carriers is currently unknown. The length of time the virus remains infectious in water is also unknown (Oyamatsu 1997a). Which fish are susceptible to CEV? Common carp and koi (Cyprinus carpio) are the only known susceptible species. However, other species including goldfish (Carassius auratus) have not yet been exposed to CEV in a controlled laboratory setting. Goldfish have been shown to be susceptible to other viral diseases affecting carp/koi such as the rhabdovirus spring viremia of carp (Petty et al. 2012). Interestingly, similar poxvirus-like agents have been partially characterized in a farmed ayu (Plecoglossus altivelis) (Wada et al. 2008), farmed Atlantic salmon (Salmo salar) (Nylund et al. 2008; Gjessing et al 2015), and a managed group of Cape seahorses (Hippocampus capensis) (Waltzek et al. 2011). Currently, little is known about the genetic relationships of CEV and other fish poxviruses. However, comparison of genetic sequences of CEV strains from around the world in common carp and koi have revealed they likely represent a single novel poxvirus species (Way and Stone 2013; Waltzek et al. 2014 ). How does water temperature affect CEV? Water temperature is an important factor in the occurrence of CEVD/KSD. In Japan, outbreaks in juvenile koi occur in the rainy season from late June to late July at water temperatures between 15 and 25°C (59–77°F) (Oyamatsu et al. 1997a), although many fish also develop CEVD/KSD in the spring and fall (Miyazaki et al. 2005). Outbreaks in koi facilities and hobbyists’ ponds in the United States and the United Kingdom typically occur at similar water temperatures (listed above) (Way and Stone 2013; Waltzek et al. 2014). However, a novel strain of CEV has been associated with UK disease episodes in wild common carp during the winter and early spring at much lower water temperatures, between 6 and 9°C (43–48°F) (Way and Stone, 2013), and similarly in the Netherlands (O. Haenen personal observation). Recently, CEVD/KSD in common carp and koi has also been reported at lower water temperatures between 7–15°C (44–59°F) in Austria (Lewisch et al. 2014). How can CEVD/KSD be prevented? Before acquiring any CEVD/KSD-susceptible fish, ask the supplier if there have been any major unexplained losses in the population. Although diagnostic tests for monitoring and verifying CEV have only been developed recently, ask suppliers if any testing for CEV has been done and request a copy of lab result documentation. The best way to prevent CEVD/KSD is to know your fish suppliers and to have a good working relationship with them. In Japan, koi producers feel that 0.5% (5g/L) salt helps to prevent the disease after the young-of-the-year fish suffer the stress of moving from the earthen nursery ponds into cement-lined ponds for grading (Seno et al. 2003; Miyazaki et al. 2005; Way and Stone 2013). Some producers also avoid harvest during periods when water temperatures are permissive for the disease (15–25°C or 59–77°F). Always isolate and test sick fish showing suspect clinical signs. Remove dead fish from ponds immediately to minimize disease transmission. Depopulate ponds harboring CEV to prevent further mortalities and ongoing spread to naïve individuals. Preventative depopulation is especially highly recommended for production facilities. Koi owners should understand the potential for ongoing disease and spread and monitor for signs of trouble. Best health management practices should be followed to minimize the risk of CEVD/KSD outbreaks. To keep fish healthy and better able to resist disease, quarantine and test new arrivals; avoid crowding and stressful events; maintain good water quality; and provide proper nutrition. Quarantine (separation from other uninfected koi) is the most dependable method to avoid the introduction of pathogens into a pond or facility (Yanong and Erlacher-Reid 2012). To implement an effective quarantine procedure, all new fish must be kept in a separate system, ideally in a different building or area from the resident fish. Feed, handle, and maintain resident fish first, then treat the new fish to avoid introducing pathogens to resident fish. The quarantined fish require dedicated equipment such as nets, buckets, and siphon hoses that are used only for them. In addition, everyone must use foot baths and hand washes when entering and when leaving the quarantine area. Fish should be quarantined for a minimum of 30 days. 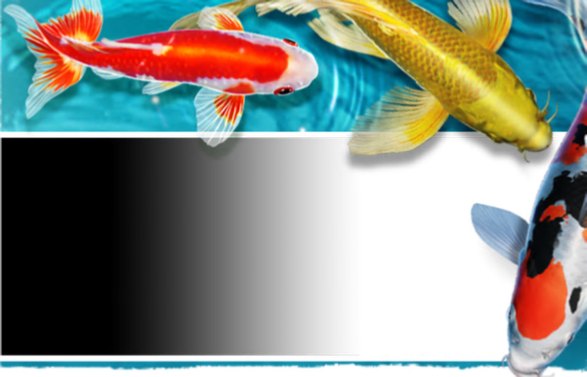 For CEV, new koi should be quarantined in water that is a constant temperature (between 15–25°C) for at least 30 days. Is CEV a risk to humans? Fish viruses do not infect humans and thus CEV is not harmful to humans. Figure 1; A group of young-of-the-year koi displaying the typical KSD behavioral abnormality of extreme lethargy manifesting as fish lying motionless on their sides or bellies on the bottom of the tank. Other external signs of infection may include sunken eyes (enophthalmos) and pale swollen gills (Figure 2, Haenen et al. 2013). These similar external signs (i.e., sunken eyes and gill lesions) may also be observed with another important viral disease of common carp known as koi herpesvirus disease (KHVD) caused by Cyprinid herpesvirus 3 (Hartman et al. 2013). No grossly visible internal disease signs have been reported with CEVD/KSD. The disease is typically observed at water temperatures between 15–25°C (59–77°F) in koi, and at 6–10°C (43–50°F) in common carp and can kill up to 75–100% of juvenile koi during an outbreak (Hedrick et al. 1997; Miyazaki et al. 2005; Way and Stone 2013). 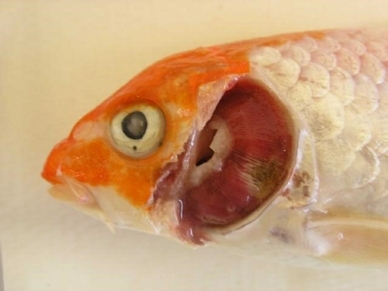 Figure 2; Koi with CEVD/KSD that presented with anorexia (loss of appetite), severe necrosis (cell death) of the gill tissue, and sunken eyes (koi had been frozen). Figure 3; Transmission electron photomicrograph of a koi gill epithelial cell containing spheroid CEV particles indicated by the arrows.